NZD115 The highest quality baby-soft cotton together with the reliable protection of RadiaShield® Fabric make this blanket a convenient and unobtrusive way to protect your child within against the risks of everyday radiation. Easily portable in your handbag, this blanket is ideal for both the home and the office. You’ll forget this breathable protector is even there while having the peace of mind of RadiaShield® protection. Belly Blanket Instructions: During pregnancy, drape over your midsection while sitting or lying down. Efficacy: 99.9% Shielding Effectiveness (~50dB). Dimensions: 75 x 90 cm. Machine wash cold with similar colors. Air dry. Do not bleach. 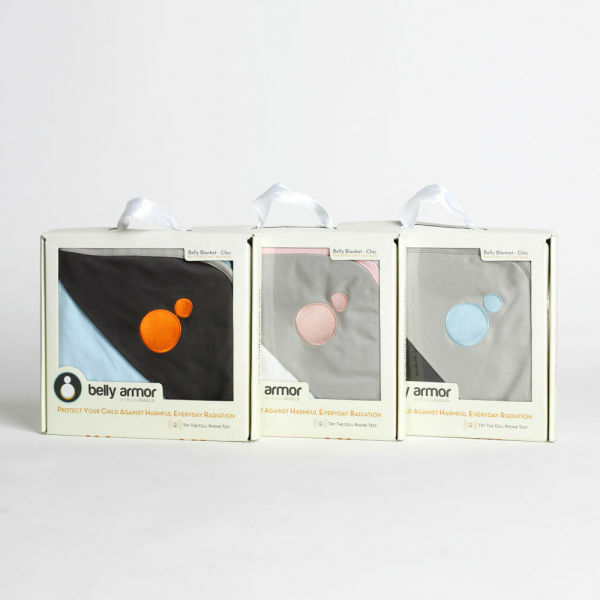 NZD130 Everything great about the Belly Blanket Chic with the added benefit of organic cotton. NZD165 Luxurious cotton micro-fleece and satin together with RadiaShield® Fabric make this blanket a convenient and unobtrusive way to protect your child within against the risks of everyday radiation. Easily portable in your handbag, this blanket is ideal for both the home and the office. With the highest quality textiles and the always reliable protection of RadiaShield®, you will fall in love with this ultra-soft protector.